When I was attending Green Valley Elementary School, I was the kid who always volunteered to run the projector on movie day. I would go to the library and Mrs. Fisher, our librarian, would check out one of the Bell & Howell 16 millimeter projectors perched precariously atop a wobbly blue media cart, and I would cautiously push it back to the classroom trying not to steer into doorways or teachers along the way. Once in the classroom, not running over the fingers of classmates was the next obstacle, since most of the fourth grade was now assembled, cross-legged, on the floor, in rapt cinematic anticipation. Kids who have grown up with DVDs and streaming videos on the internet may never appreciate the thrilling sense of empowerment that comes from knowing how to thread a film reel properly through a projector, or how to focus the image on the shabby screen pulled down to cover the chalkboard, or how to finesse the leveler on the projector by sliding a spiral notebook under one corner. Some movies were two-reelers, which meant halfway through the film you had to stop and put on a new reel. And when the movie was over, all the reels had to be run backwards onto the original reels and then returned to their round, metal canisters, and everything went back to the library. Besides being a great way to get out of class, it also helped fuel my passion for film. There was something hypnotic about sitting next to a projector while it rhythmically clicked and hummed its way through thousands of frames as the heat from the bulb slowly created a rotisserie effect on the left side of your face. As enamored as I am with the pristine quality of today’s digital media, there is something that is lost without the sounds and smells of celluloid snaking through sprockets past a blisteringly hot bulb. Thankfully, despite the near-extinction of projectors in homes, schools, and even movie theaters, the movies themselves are largely available in a preponderance of digital options. One of the movies I remember watching with some regularity in elementary school was a French film made in 1956 called Le Ballon Rouge, or The Red Balloon. It’s an engaging and magical film, despite being just 34 minutes long. 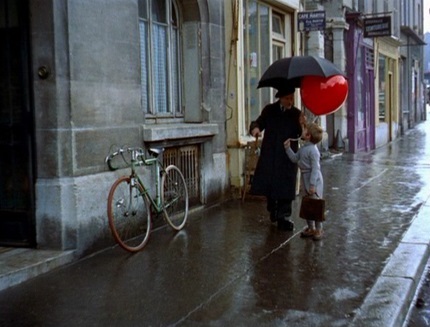 Set in the streets of Paris, The Red Balloon is a love story, of sorts, about a little boy and a big, red balloon. Walking to school one day, the boy finds the balloon entangled on a lamp post. He climbs the pole and frees the balloon, and they set off together to school. The balloon is quite large, so he’s not permitted to take it on the bus, nor is he allowed to take it into the school. But the balloon somehow follows him and waits for him, and at the end of the day it goes home with him. The next day, jealousy grows amongst other boys who try to get the balloon away from him after school, and even Saturday brings no relief from the bullying. There is never any explanation for the balloon’s behavior, nor is one necessary. The boy’s innocence conjures memories of the sweet naiveté of childhood, while the mob mentality of the bullies is universally understood at any age. Against the backdrop of 1950’s Paris, the film is rich with texture and depth. The muted cobblestone pallet and classic European architecture provide an intoxicatingly complex canvas for painting such a simple story about a boy and a bright, red balloon. The picture is populated with the people of Paris, whose faces and frames are as deep and as textured as the streets they inhabit. It’s a French film, so there are subtitles, but they’re hardly necessary. There are only a handful of spoken lines, and most of them are easily understood without explanation. What makes this film so powerfully good is that the language and the time and the location are all incidental; this story could take place anywhere, any time. The Red Balloon won several awards around the world, even winning an Oscar for Best Original Screenplay. This is particularly noteworthy because there is almost no spoken dialogue in the movie, and because it is the only short film to ever receive that distinction. But the awards are not the reason you should watch this film; the awards simply acknowledge what everyone who has seen the film will tell you: it’s wonderful. Watch this movie with your kids, your grandkids, or by yourself. Watch it on Netflix or Amazon, or get the DVD. Or, if you’re really lucky, maybe Mrs. Fisher will let you check it out of the library. Call me if you need help with the projector.